Since its establishment in the Tokyo Music School, the predecessor of the Faculty of Music at Tokyo Geijutsu Daigaku, the Department of Composition has explored and provided instruction in methods and techniques associated with musical composition in modern Western music. Since its migration to the new university in 1949, the department has also engaged in educational and research activities involving the study of traditional European music theory and the synthesis of new creative forms in the postwar period, serving as a center of excellence for musical creation in Japan. 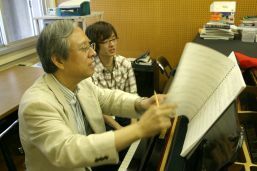 The curriculum of the Department of Composition comprises Practical Composition Skills I subject in the undergraduate program that consists of submissions in the primary instrumental music genres within modern European music such as instrumental duets, chamber music, orchestral music, and vocal music (in Japanese), including university concerts and graduation works. At the same time, Composition Practical Skills II that includes practical training in harmony, counterpoint, and fugue is also studied. Students acquire necessary knowledge for the creation of music such as a basic knowledge of computer music, orchestral music, and an analysis of musical styles ranging from historical styles of writing music to contemporary musical techniques. The Master’s Program implements education that emphasizes on fostering a more individualized creative attitude among students based on contemporary perspectives. Furthermore, in the Doctoral Program students receive research guidance about creating works as well as about the theoretical research on modern music from the teaching staff of the Department of Composition and those in the concerned research field. Furthermore, public lectures comprising demonstration of creative works by students and lectures by international representative composers or bands of modern music have been established for students of the Department of Composition. With respect to conferment of an undergraduate degree by the Faculty, a Bachelor’s degree is awarded once a performance review has been conducted of the creative work submitted in the abovementioned major genres (instrumental duets, vocal music) and when in the fourth year, graduation has been certified after the music review committee of the department has conducted a review of the freely composed creative work of the student at the Sogakudo Concert Hall. Learning achievements are publicly presented following the performance of outstanding creative compositions, with chamber music works performed at the Old Sogakudo Concert Hall, and performance of orchestra works and graduation works by the Geidai Philharmonia held at the Sogakudo Concert Hall. In the Master’s Program, acquisition and research related to the diverse modern composition styles and techniques is conducted and the Master’s degree is awarded once the completed creative work has been reviewed. In the doctoral program, students conduct research related to the relationship between their own creative work and the modern theory of composition, submit a dissertation which is reviewed along with the completed creative work, after which the doctoral degree is awarded. Composition I, a required subject, requires students to create and submit pieces of their own including duet works, vocal works, chamber works, and orchestra works. A concert given in the university concert hall provides students with the opportunity to perform their own works. Selected chamber-music and orchestra works submitted by students are performed in Thursday concerts (held in the university’s older concert hall) and in the Geidai Philharmonia’s Morning Concerts series (held in Sogakudo Concert Hall). The Geidai Philharmonia performs a single selected graduation-project work (a wind and string work) at a concert in which new graduates are the featured soloists (held in the concert hall). Composition II, another requirement, involves practical training in compositional analysis and in the traditional Western musical techniques of harmony, fugue, and orchestration. Other required subjects include solfege, foreign languages, and general education. Electives including research of music grammar, techniques of a contemporary composition, and computer music are also taught. The graduate composition program provides students with opportunities for both creative freedom and the continuing study of composition techniques. In the “Sozo no mori” concert series held in the concert hall, the Geidai Philharmonia plays selected orchestra works written by graduate students. Based on its position as a point of contact between traditional Japanese music and modern and contemporary European music, the Department of Composition is currently seeking to identify future directions in international exchange and the acceptance of international students. Graduates with undergraduate and graduate degrees from the Department of Composition are active across a wide range of fields both in Japan and around the world, and make important contributions to the Japanese music world.